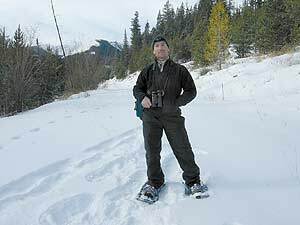 Local birder Russ Namitz snowshoes at the McCully Creek trailhead near Joseph in Eastern Oregon in November last year, seeking to add to his record-breaking number of bird species seen in Oregon in one year. Russ Namitz birds off a tuna fishing boat last August, looking for pelagic birds to add to his big year attempt. He spent 14 days on the Pacific Ocean in Oregon waters, and saw two birds for the first time in his life: a Murphy’s petrel and Hawaiian petrel. The emperor goose was the last species, No. 381, that Russ Namitz spotted in his record-breaking big year. Russ Namitz saw a tropical kingbird in Brookings last September, a species that usually breeds in southwestern states such as Arizona, but sometimes wanders north post-breeding. The bird is an uncommon species to see in Oregon. Local birder Russ Namitz spent much of his free time last year camping in the back of his truck across Oregon and eating Subway sandwiches along the way. It was all worth it - after driving 41,000 miles throughout Oregon, Namitz saw bird species No. 381 on Dec. 27, crushing the previous state record of 363 for what's called a "big year" in the birding community. This wasn't the first time he'd attempted a big year, but it was the first time he put his heart and soul into the excursion. In 2007, he saw 355 species. "I didn't do all the things I knew I should have done to be successful," he said. "I was just trying to place in the top 10. This year, I was trying to break a record." It was the perfect setup for the Marshfield High School teacher. He usually takes a trip out of the country in the summer, but last year he didn't, and since he gets summers off, he had ample time for statewide travel. He also often visits family back east over the holidays, but last year he stayed in Oregon. So he took advantage of the extra time (and plenty of weekends, too) to dedicate himself to a record big year. "The timing was right this year," he said. "I started Day 1. There was some obvious planning." Migrations, breeding and reported rare bird sightings all play a part in mapping out a big year. In spring and fall, he sought "migrant traps," or places where migrating birds often fly over, such as the Malheur National Wildlife Refuge in southeastern Oregon. He took note of breeding birds, and when and where they breed so he could find them. He also relied on technology, including Oregon Birders Online, which is an email list and online database that often serves as a rare bird update. Along with texts from friends around the state, he was able to chase certain birds when other bird watchers comfirmed sightings. Despite seeing 381 species, he missed out on a few sightings. "I had extreme good luck, but I did have a lot of misses," he said. He said he was late in checking Oregon Birders Online one day, and saw that a vermilion flycatcher was seen in Portland. He took off for the city after he saw the post at 3:30 p.m., but got there after dark and stayed the night so he could look for the bird in the morning. "It was gone the next day," he said. Sometimes the journey didn't go as planned. He searched for the least bittern in Klamath Marsh National Wildlife Refuge in August, but it's a reclusive species that hides in reeds just above the marsh water. Boating is the best method, and he only had one weekend to attempt a sighting. His inflatable kayak had a hole in it, but he was eager to spot the bird. Under pressure of the small viewing window, he resorted to covering the hole with duct tape. In the middle of his search, the duct tape failed and his kayak sank, forcing him to abandon the least bittern attempt. "I had to drag my basically sunk kayak to the shore and the nearest road, and hike two miles back to my truck in my sandals," he said, laughing, adding that the mosquitos began attacking him right at that moment. But his adventures also took the native Oregonian to places he'd never seen - like the Oregon Canyon Mountains. He traveled to the remote portion of Eastern Oregon to see a Virginia's warbler, and his truck took a beating on the back roads searching for isolated patches of mountain mahogany, a tree that often houses the warbler. "It's a long drive out there, then once you get there, you have this rocky, bumpy road," he said. "And once you get there, you wander around looking for the bird. You need to be in the right place at the right time." 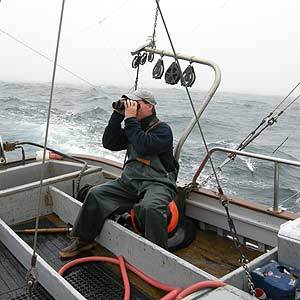 He also spent 14 days on the ocean, including a cruise from San Francisco to Canada, looking for birds in Oregon waters. He saw two birds that he'd never seen in his life, and they both came on the Pacific - the Murphy's petrel and Hawaiian petrel. "My favorite birds are those I had never seen in my life, or those I'd never seen in Oregon," he said. "The rare ones, they add a little excitement." He said seeing the red-necked stint at New River south of Bandon was rewarding because of the work he had to do to reach it, and he'd never seen that bird in Oregon before. "It's isolated," he said. "I had to walk two miles down the beach, cross the river." He tied local birder Tim Rodenkirk's record of 363 in September with a chestnut-sided warbler, a bird Rodenkirk even brought to Namitz's attention. "He was actually pretty inspirational," Namitz said. By Dec. 27, when he saw his final species, an emperor goose at the Tualatin River National Wildlife Refuge, Namitz had shattered the previous Oregon big year record. The total recorded number of bird species in Oregon is listed at 524, and Namitz saw 72 percent of them. He said he wouldn't have succeeded without the support of his employer, fellow birders and his understanding wife, Jennifer Feola. He said he and Feola tried to use some weekend birding trips as mini-vacations, and he promised that she could remodel the kitchen during his big year. Namitz isn't going to chase a new number, even if another birder breaks his record - he's done. Plus, he set the bar pretty high. "Doing a big year involves time and money," he said. "To be the most successful, you have to have both. "And I put in a lot of both." He even ran right past his personal goal of 370, a number he chose because he turned 37 years old. "I had a secret goal to get 370," Namitz said. "I had no dreams that I would make 381." Outdoors Editor Rachel Finney can be reached at 541-269-1222, ext. 237, or at rfinney@theworldlink.com.